Matt Faulkner, perhaps best remembered the serviceable but unremarkable starter in 2011 for San Jose State, has signed as the first quarterback for the expansion Ottawa Redblacks of the Canadian Football League. He is the first quarterback under contract for the team, which will begin building its team in earnest on Monday with the expansion draft. In his one year starting for the Spartans, he completed a shade under 65 percent of his passes for 3,149 yards, throwing as many touchdowns (13) as he did interceptions (13). He had transferred from Fresno State and Mt. San Antonio College. The Ottawa Citizen places him as likely third on the depth chart, since the Redblacks will at least get two QBs with CFL experience in the expansion draft. This is the third attempt at a CFL franchise in the Canadian capitol. The Ottawa Rough Riders went for more than 75 years before folding in 1996. The Ottawa Renegades went from 2002 to 2005 before the league forced the team to cease operations. Tyler Winston parlayed a strong freshman year as Noel Grigsby’s replacement into an award from the Mountain West Conference this year, winning the conference’s freshman of the year award after a strong first season. He caught 58 balls this season for five touchdowns and 858 yards, a 14.8 yards/catch average. Not bad for someone who was needed as an emergency replacement for the senior Grigsby, who was lost for the season in the early going. He leads a class of three other Spartans on the all-Mountain West first football team, with David Fales predictably losing out on the first QB spot to Derek Carr from Fresno State. Receiver Chandler Jones, cornerback Bene Benwikere and linebacker Keith Smith all earned first team honors. Fales was the second team quarterback along with offensive lineman Nicholas Kaspar and kicker Austin Lopez. Freshman tight end Billy Freeman and offensive lineman Ryan Jones were honorable mention. The conference awards were: Offensive player of the year, Derek Carr, Fresno State; Freshman of the year, Tyler Winston, San Jose State; Special teams player of the year, Carlos Wiggins, New Mexico; defensive player of the year, Shaquil Barrett, Colorado State; Coach of the year, Matt Wells, Utah State. 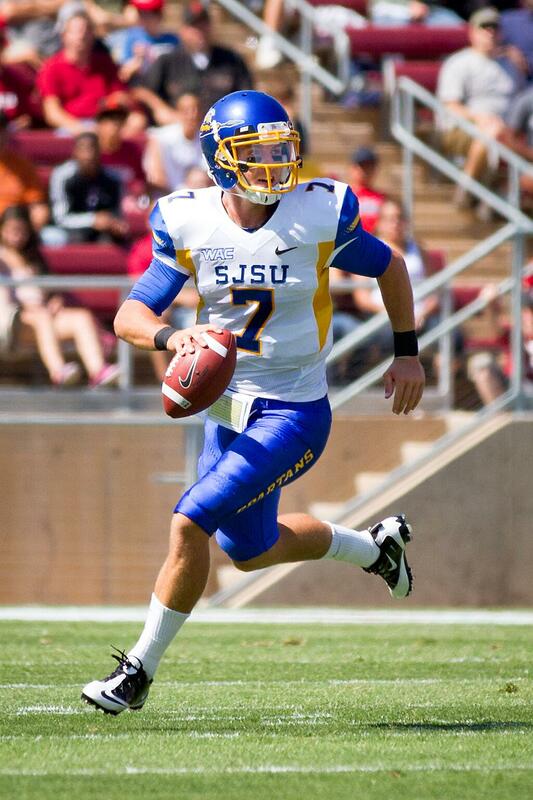 More awards for San Jose State’s young’uns: Tyler Winston earned another honor this week to. He and three other San Jose State freshmen and sophomore kicker Austin Lopez earned honorable mention on the College Football News’ freshman and sophomore all-America teams. Winston, running back Jarrod Lawson, linebacker Christian Tago, tight end Billy Freeman earned spots on the freshman team, while Lopez was honorable mention on the sophomore team. Jon Wilner doesn’t waste your time this time: Taking time away from his stumping for the big conferences, he writes about why San Jose State didn’t deserve a bowl game. From Gary Klein of the Los Angeles Times, next Saturday’s Las Vegas Bowl will be a reunion for two Bakersfield products in USC quarterback Cody Kessler (who graduated from Bakersfield Centennial) and Fresno State’s Derek Carr (who went to Bakersfield Christian.) The two are good friends. Step 1 for UNLV: Make bowl game. Step 2: ?????. Step 3. Profit? So writes Ed Graney of the Las Vegas Review-Journal, which has its postseason berth and now much figure out how it will pay for things like travel and the likes. Side note: No one from UNLV earned first team All-Mountain West honors this year, despite the team’s 7-5 record. Three made the second team: lineman Brandon Boyko, receiver Devante Davis and running back Tim Cornett. My thought: The Rebels got their bowl game, they can deal with it. San Diego State is busily preparing for its bowl game in Boise by trying to practice outdoors as much as possible, reports the Union-Tribune. Two problems: San Diego is rather balmy this time of year compared to Boise (which might not get over freezing for game time), and they are having to share practice facilities with Boise State as they prepare for the Hawaii Bowl on Christmas eve. Colorado State sophomore running back Kapri Bibbs was named second team All-American this year. In a wild bit of speculation from the Fort Collins Coloradoan, reporter Kelly Lyell looks into whether Rams coach Jim McElwain could be an option to replace Nick Saban at Alabama should he leave the Crimson Tide for, say, Texas. McElwain won two national titles as offensive coordinator for Saban in 2009 and 2011. But the reality is, with his buyouts at $4 million this year and $3 million next year, he’s probably not leaving Fort Collins this year.